I'm so sorry that you've had such a hard time. But very glad that your sun is shining again! I hope that your husband continues to heal well and completely! I love your flowers and vase. I, too, am a collector of rusty and old.. Welcome back! Wishing you a wonderful week. It is so good to see you back blogging again. It has been a rough road for you. Love these creative flowers they are just adorable. Have a wonderful week. Hopefully with the weather getting better that will help chase everyone's blues away. I love your metal bouquet dear Julia! What a beautiful piece of artwork!!! I am sorry to red that it has been a difficult time for you. You both went though a lot with the accident and sometimes when our bodies take a blow, it takes awhile to find ourselves again. I hope that you will soon feel joy come back into your life. I can really relate to the menopause thing though, and even though my mother went through it easily, it hasn't been so for me. I know I went through some sadness and just not feeling right. I now feel so much better, like the sun is up again. I hope the same for you my dear. I know this has been a very difficult time for you. I'm so happy to see you creating again and hope to see more soon. I absolutely LOVE these sweet flowers. You haven't lost a bit of your creativity. 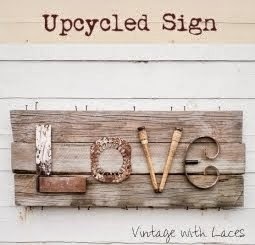 Thanks Julia for sharing with Vintage Inspiration Party. Very clever and fun project! Love it! Love it! Especially the use of the glass beads to magnify the flower's center. So fun! I love your flowers. So unique! My dear Julia, - I`m so happy for you, that you are feeling good again, and back, here on your blog. It felt good seing your name again my friend ! Meantime, I`m the one not feeling too good, but I hope it will clear, too, in time. Your skills creating your wonderful bouquet, are fantastic, and it is colourful and a most happy mix of flowers. Love your rust and all. Have a lovely evening Julia, I dearly hope hubby will be much better, in time !! You have been sorely missed. Welcome back. Love these rusty flowers…so fun and creative!!! Prayers for sunny days…I know these will keep a smile on your face! Thanks for sharing!!! Hi Julia! It's good to see you back! Love your map flowers, so pretty! To a speedy recovery to you and your husband! Deine Blümchen gefallen mir auch total gut. I am so happy to see you blogging again, my dear Julia. Dang, those flowers are fabulous. 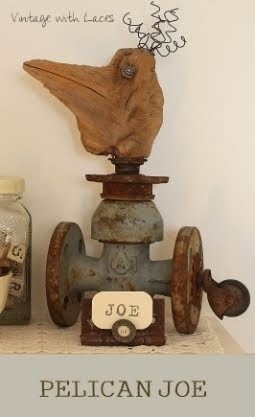 You have such a wonderful knack of combining rusty old stuff with newer things and making the most amazing and attractive art pieces. Hach Julia, wie schön, dass du wieder da bist! Ich hab schon befürchtet, dass du jetzt durch die lange "Gesundheitspause" einfach keine Lust mehr für dieses doch recht zeitaufwendige "Hobby namens Bloggen" hast... Dass es dir so schlecht gegangen ist, tut mir sehr, sehr Leid - ich denk mir mal, wenn eine Julia keinen Antrieb zum Kreativsein verspürt, dann ist wirklich etwas ganz schön im Argen... Aber oftmals sind solche Brüche auch wertvolle Sammel- und Umbruchsphasen, wo sich in einem Drin etwas erneuert. Das geht halt selten ohne Schmerzen ab. Deine Blumen in der originellen Vase erscheinen mir jedenfalls so, als hätte sich etwas bei dir verändert - vielleicht sind sie nicht symptomatisch, das kann ich nach nur einem Werkstück nicht sagen, aber diese Farbenfreude ist jedenfalls relativ neu bei dir. Und sie gefällt mir richtig gut! Lass dich drücken und gib bitte auch herzhafte Fellchenkrauler weiter! So very lovely to see a new post from you after your absence from the bloggerhood! You've been missed! Your Colourful Rusty Map flowers are both pretty and practical! ;)) I completely agree: not using chemicals on our edibles and our lovelies usually is high maintenance work, with no real guarantee, but this bouquet promises daily doses of joy! Two of my favs- rusty and maps! Thanks for your kind comment on the missing cat Dexter. This is my first visit to your blog and I am sorry to hear of your accident. I know from experience that sometimes we lose our crafting mojo so glad yours is coming back. Soooo pleased that you are back with us! I've had no internet connection for the past week but am finally able to comment again - total frustration! I know it has been a hard journey sweetie but look at you now and the amazing art you are creating - so much beauty out of rust and wire. Those flowers will smile upon you everyday and never die. I am glad to see Helmut is slowly getting back too. Love to you both and big warm hugs all the way from here. Dear Julia so good to see you are blogging again, your flower are so wonderfully made of thing many people throw out, thanks for all your lovely comments on my blogs. Great to see you back. Spring is really a great help with the blues and maybe will jump start your mojo as well! Glad to hear you are both on the road back, it sounds like it's been a long road. Sending hugs! LOVE the flowers!!! How cute and cheerful. Julia, I do hope that you both get to feeling better soon. Menopause has had a sting on my moods, too, but I try to keep a positive attitude. I find that sitting down and creating makes things better. So glad you are feeling better, lots of prayers and love were sent your way in our minds! Glad your creativity has returned. I know how I feel when something hits me hard, and I can't even go into my studio room. It's just too hard. Love your flowers! They are so cute! Your flowers are so awesome - found them at the vintage inspiration party and I'm so glad you posted them!